I entered on duty in the National Park Service February 6, 1931, as an assistant director (grade CAF-13) at a yearly salary of $5,600, to head the Branch of Lands. The service at that time occupied the third floor of the east wing of the old Department of the Interior building, between Eighteenth and Nineteenth streets and E and F streets, N.W., in Washington. The next two years were interesting as a breaking-in and training period for me before the intensified activities of the New Deal period. The National Park Service was then approaching its fifteenth anniversay. Its founder and first director, Stephen T. Mather, had retired in 1929. My father had been with Mather in 1921 when he, Horace Albright, and Secretary of the Interior John Barton Payne organized the National Conference on State Parks, in Des Moines, Iowa. Although I was too late to qualify as one of the devoted and capable group known as the "Mather men," once in the service I found myself surrounded by them. They were the core of about twenty-five people in the Washington officea loyal, hard-working group. The thoroughness that Mather and Albright applied to insure a good, sound organization based on an equally sound policy, one constructed and documented to last through the years, quickly became apparent to a new staff member. For the information of the public, an outline of the administrative policy to which the new Service will adhere may now be announced. This policy is based on three broad principles: First, that the national parks must be maintained in absolutely unimpaired form for the use of future generations as well as those of our own time; second, that they are set apart for the use, observation, health, and pleasure of the people; and third, that the national interest must dictate all decisions affecting public or private enterprise in the parks. Owing to changed conditions since the establishment in 1917 of the National Park Service as an independent bureau of the Department of the Interior, I find it advisable to restate the policy governing the administration of the national park system to which the Service will adhere. Third, that the national interest must take precedence in all decisions affecting public or private enterprise in the parks and monuments. The duty imposed upon the National Park Service in the organic act creating it to faithfully preserve the parks and monuments for posterity in essentially their natural state is paramount to every other activity. The commercial use of these reservations, except as specifically authorized by law, or such as may be incidental to the accommodation and entertainment of visitors, rs not to be permitted. It is not too difficult to recognize that these letters were carefully prepared by the team of Mather and Albright and signed willingly and with pleasure by the secretaries of the Department of the Interior so as to establish firmly the administrative policy in conformity with the legislation. Secretary Lane was a Democrat, and Secretary Work a Republican. Yellowstone National Park, established March 1, 1872, marks the beginning of the National Park line and the center of gravity of the chart. . . . Although Yosemite State Park, created by Federal cession in 1864 to protect Yosemite Valley and the Mariposa Big Tree Grove, was an important conservation milestone, Yellowstone was the first full and unfettered embodiment of the National Park ideathe world's first example of large-scale wilderness preservation for all the people. The United States has since exported the idea around the globe. The remarkable Yellowstone Act withdrew some two million acres of public land in Wyoming and Montana Territories from settlement, occupancy, or sale and dedicated it "as a public park or pleasure-ground for the benefit and enjoyment of the people." Furthermore, the law provided for preservation of all timber, mineral deposits, natural curiosities, and wonders within the park "in their natural condition." The twin purposes of preservation and use, so important and so susceptible to conflict, yet so eloquently reaffirmed by Congress when the National Park Service was established in 1916, were there from the beginning. One milestone in this history is notablethe emergence of a distinction between National Parks and National Forests. Eighteen years elapsed after the Yellowstone Act before another scenic park was authorized, and then threeSequoia, Yosemite, and General Grantwere created in the single year of 1890. Yosemite and General Grant were set aside as "reserved forest lands," but like Sequoia they were modeled after Yellowstone and named National Parks administratively by the Secretary of the Interior. The very next year, in the Forest Reserve Act of 1891, Congress separated the idea of forest conservation from the National Park idea. That act granted the President authority to create, by executive proclamation, permanent forest reserves on the public domain. Here is the fork in the road beyond which National Parks and National Forests proceeded by separate paths. Within sixteen years Presidents Cleveland, McKinley, and particularly Theodore Roosevelt established 159 National Forests containing more than 150 million acres. By 1916 Presidents Taft and Wilson had added another 26 million acres. During this same period each new National Park had to be created by individual Act of Congress, usually after many years of work. Nevertheless, by 1916 eleven National Parks including such superlative areas as Mount Rainier, Crater Lake, Mesa Verde, Glacier, Rocky Mountain, and Hawaii, had been added to the original four and Mackinac abolished, bringing the total number to fourteen and the acreage to approximately 4,750,000. While the early National Parks were being created, a separate movement got under way to preserve the magnificent cliff dwellings, pueblo ruins, and early missions discovered by cowboys, army officers, ethnologists, and other explorers on the vast public lands of the Southwest from plunder and destruction by pot-hunters and vandals. The effort to secure protective legislation began early among historically minded scientists and civic leaders in Boston and spread to similar circles in Washington, New York, Denver, Santa Fe, and other centers during the 1880's and 1890's. Thus was born the National Monument idea. With important help from Rep. John Fletcher Lacey of Iowa and Senator Henry Cabot Lodge of Massachusetts, it was written into law in the Antiquities Act of 1906with profound consequences for the National Park System. "Be it enacted by the Senate and House of Representatives of the United States of America in Congress assembled, that Congress declares that the national park system, which began with establishment of Yellowstone National Park in 1872, has since grown to include superlative natural, historic, and recreation areas in every major region of the United States, its territories and island possessions; that these areas, though distinct in character, are united through their interrelated purposes and resources into one national park system as cumulative expressions of a single national heritage; that, individually and collectively, these areas derive increased national dignity and recognition of their superb environmental quality through their inclusion jointly with each other in one national park system preserved and managed for the benefit and inspiration of all the people of the United States; and that it is the purpose of this Act to include all such areas in the System and to clarify the authorities applicable to the System." The title of Ron Lee's Family Tree of the National Park System is apt, for it suggests more than a genealogy. Through the years the people of the National Park Service have often been referred to as the "Stephen T. Mather family," and they have, as Steve Mather did, devoted time and effort over and above their official duties to protect and manage the National Park System. (When I say "the people of the National Park Service," I include spouses and children as well as employees.) I am certain that they inherited this fondness for their assigned responsibilities as the protectors of the nation's great heritage of natural and human history from those who pioneered in the establishment of the first national park, Yellowstone, and those who subsequently developed a chain of such reservations for recreational use or cultural preservation throughout the country. Mather contributed much of his private fortune and all of his energies the last eleven years of his life to organizing the Park Service, formulating policies, and developing the park system. There are several instances of other people with private means who followed his example. Among them was George Wright, a man of independent fortune and a dedicated worker in the service. He served without salary for a while and paid the salaries of some of his staff when Congress failed to make funds available. Another was Roger Toll, an engineer from Denver. He followed Horace Albright as superintendent of Yellowstone and field assistant to the director when Albright moved to Washington to devote his full time to assisting Mather. Both Toll and Wright met their tragic deaths in an automobile accident in the Southwest while studying proposed international park sites along the Mexican boundary. Among the many others whose generosity benefited the Park Service, I should include George B. Dorr, superintendent of Acadia National Park in Maine, a man of considerable means who spent much of his own money buying land for the park. John D. Rockefeller, Jr., also spent a lot of money buying land for Acadia, and the joke of the time was that Superintendent Dorr was trying to outdo Rockefeller. When the time came for his retirement as superintendent of the park, he had spent all of his substantial fortune and had only two old family homes left. Representative Cramton, of Michigan, then chairman of the Subcommittee on Appropriations for the Department of the Interior, was apprised of Dorr's circumstances. He persuaded Congress to write into the appropriation act a specific amount each year for the salary of Superintendent Dorr of Acadia National Park. Dorr later willed his holdings to the government, and the old family home, with one-quarter mile of waterfront, became a part of Acadia National Park. This deep feeling of concern and responsibility for the parks continues today, and while there may be no individuals of comparable wealth in the service at the present time, the Mather spirit prevails: complete dedication and devotion to the protection of the great scenic, historic, and scientific areas of the national park system for the use and enjoyment of the people. Mather may not have originated the idea of providing park visitors with interpretation of what they saw in the national parks, but he believed in it strongly and adopted this public service as one of the cornerstones of his overall policy. The concept evolved over the years into the establishment of a strong ranger force responsible for the protection and informed use of the national parks. This force grew, and as conditions changed and gradually demanded new skills and specializations in protection and interpretation, its members became classified as ranger naturalists, ranger historians, and a ranger protection force. The early park buildings contained what were called museums. These were gradually changed until, during Mission 66, they became focal points for all park activities and were named visitor centers. Today almost every area of the system has a visitor center where information concerning the area's indigenous features is available to the public. The Washington office staff of the National Park Service in 1932. Left to right: Assistant Director Conrad L. Wirth, Associate Director Arno B. Cammerer, Chief Clerk R. H. Holmes, Director Horace M. Albright, Assistant Director Harold C. Bryant, Senior Assistant Director A. E. Demaray, Assistant Director G. T. Moskey, and Editor Isabelle F. Story. Not all of these aids to park use are paid for by tax dollars. Since the beginning of the service the rangers, and to a great extent their families, have been on duty around the clock. 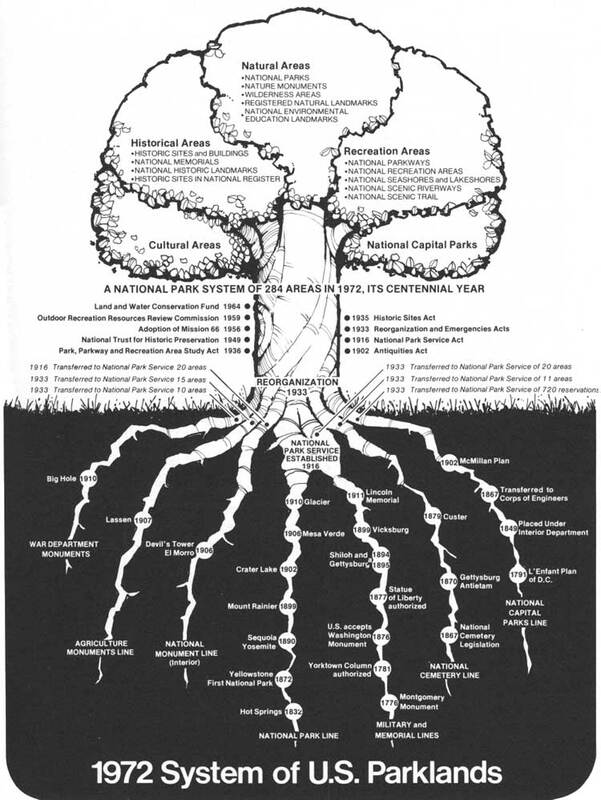 In the Mather-Albright era the larger parks formed natural history associations that, under agreements with the service, undertook to prepare, print, and distribute literature for the park visitor. They charged nothing for their time or efforts, and any profits from sales were used to prepare additional material and buy needed equipment for the interpretive program. Even the neighbors around the parks joined in and assisted these associations with their activities (see chapter seven). The executive roster of the National Park Service at the beginning of the New Deal, March 4, 1933, was about the same as when I entered on duty in 1931. Director Albright's right-hand man was Arno Cammerer, assistant director from 1919 through January, 1926, and associate director from 1926 and 1933. Arthur Demaray was the senior assistant director in charge of general administrative matters, having under his jurisdiction personnel, finances, and so on. He had transferred to the National Park Service in the early twenties as a draftsman and went on to become the editor of publications, then assistant director, and then senior assistant director in 1929. George A. Moskey, assistant director, was the service's lawyer and handled legal matters, including legislation. In those days the bureaus had their own attorneys rather than having to depend on the solicitor of the Interior Department, as is now required. Harold C. Bryant, a naturalist, was the assistant director in charge of the Branch of Natural History and Interpretation. He had been in the field for a number of years and had transferred to the Washington office in 1930. Hillory A. Tolson was Moskey's assistant. 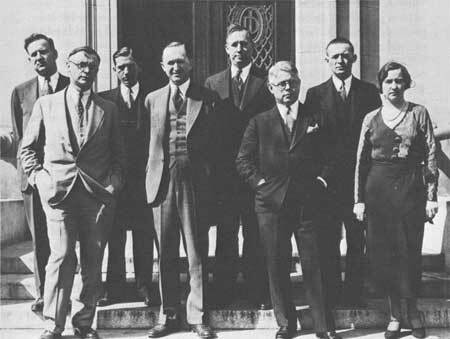 In October, 1933, when Albright left to become vice-president and general manager of the U.S. Potash Company, Cammerer stepped up to be director, Demaray became associate director, and Tolson was promoted to assistant director in charge of the Branch of Administration. Isabelle F. Story was the editor for the National Park Service and supervised the preparation of informational bulletins and other printed material. Charles L. Gable was head of the Concessions Division, and R. M. Holmes was chief clerk. As assistant director in charge of the Branch of Lands, I had responsibility for all land matters, including investigation, study, and reporting on proposed new areas for the park system, as well as land acquistion. Superintendent Roger Toll of Yellowstone was the principal pivot man for most of the field investigations of proposed new parks and monuments. I had a secretary and two draftsmen in my Branch of Lands, and besides land maps we prepared maps used in the publications issued for park visitors. The national highway system of the western states wasn't anything like it is today, and our Park-to-Park Highway Map of the western parks was always in demand.